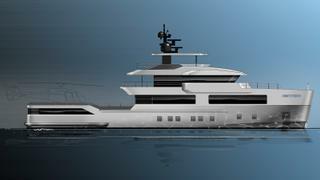 Omega Architects and Van Oossanen Naval Architects have released details of their latest collaboration, the NedXplor 38 concept. Offered for sale with IYC, whose Monaco broker Bernie Challis helped to develop the project, this 38 metre full displacement explorer yacht would be built to MCA LY3 standards at an undisclosed Dutch shipyard. Designer Frank Laupman explained that she balances form and function with “a bold, masculine exterior, complemented by a warmer, feminine elegant interior”. The explorer aesthetic is reinforced by a near-vertical bow, which maximizes interior volume, and reverse-angled wheelhouse windows — ideal for passagemaking in all conditions. Accommodation is for up to ten guests split across five cabins, including a full-beam owner’s suite situated on the main deck, as well as two doubles and two twin cabins on the lower deck. The crew quarters, suitable for a staff of up to seven people, are situated in the bow, leaving the aft free for storing tenders and toys. 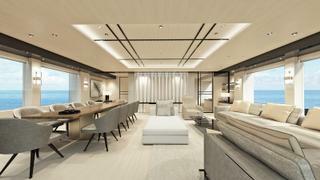 This versatile space can be easily transformed into a superyacht beach club and gymnasium, the designers add. The spacious main deck aft is another key feature — large enough to be set up as either a helipad or storage space for additional tenders. Power would come from a pair of 1,000hp Caterpillar C32 engines for a top speed of 15 knots and a cruising range of 5,032 nautical miles at 11 knots. Van Oossanen explains that this globetrotting ability is made possible by the fitment of a hull vane, which also reduces pitching and rolling motion.